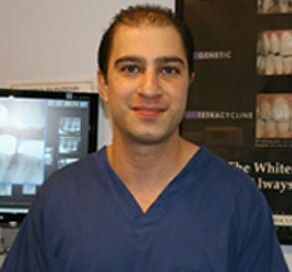 Dr. Mansouri is our endodontist at Pasadena Dental Aesthetics. A specialist in root canal therapy and oral microsurgery, Dr. Mansouri strives to provide the most up-to-date, technologically advanced care with a compassionate and caring touch. An active board eligible member of the American Association of Endodontists, he was recognized as one of “America’s Top Dentists” in the 2009 Guide to America’s Top Dentists. He is also a member of the California Dental Association, the American Dental Association, and the Alpha Omega Dental Fraternity. Dr. Mansouri graduated with honors from the University of California, Los Angeles (UCLA) with a bachelor of science in biology. He received his Doctor of Dental Surgery (DDS) degree from the UCLA School of Dentistry and completed advanced endodontics specialty training at Saint Louis University, where he also received a master’s degree. A native of Los Angeles, Dr. Mansouri and his wife, a practicing pediatric dentist, are looking forward to raising their own family in the city and sharing their love of dentistry, sports, travel, and music.